The Asus ROG G703GI is one of the most powerful gaming laptops we’ve ever tried, which also makes it one of the most expensive. If you can get past the high price tag and short battery life, you get an amazing portable gaming machine that can handle the latest games with ease. The Asus ROG G703GI is the second generation of the Asus ROG G703, a monstrous gaming laptop that impressed us with its brilliant performance and solid build quality, yet suffered from a bulky design, high price tag and poor battery life. With the ROG G703GI, Asus has boosted the hardware further, making it an even more formidable gaming machine. However, while these boosted specs enable it play the latest games better than ever before, it could also exacerbate the issues the previous generation of the G703 suffered from, especially in the price and battery life department. The Asus ROG G703GI is available in a number of configurations, with the options differing slightly depending on which country you buy it in. In the US there's the G703GI-XS74, which comes with an Intel Core i7-8750H Processor, 17.3-inch 1080p G-Sync display, overclocked Nvidia GTX 1080 graphics card, 32GB of DDR4 RAM, two 256GB PCIe SSDs and a 1TB hard drive. This costs $3,499. Then there’s the G703GI-XS98K, which comes with the same spec, but with an Intel Core i9-8950HK processor and a 2TB hard drive for $3,699. At the top of the range is the G703GI-XS99K, which has the same spec as the XS98K but with 64GB of RAM and three 512GB PCIe NVMe SSDs. This version costs $4,999, and it’s the model we have in for review. In the UK the range starts with the G703GI-E5005R, which comes with a 1080p screen, Intel Core i7-8750H Processor, 32GB DDR4 RAM, two NVME M.2 SSDs, 1TB hard drive and an Nvidia GTX 1080 graphics card, and costs £3,199.99. There's also the G703GI-E5088R, which comes with a six-core Intel Core i9-8950HK processor, with the rest of the spec the same as above, and a price tag of £3,499.99. These are incredibly pricey machines, then, putting them in a similar price bracket as the Asus ROG Zephyrus GX501 and the Razer Blade Pro. The sting is taken out of the price a little by the inclusion of a gaming backpack, headset and mouse, but this is still an eye-wateringly high price tag, and one the Asus ROG G703GI will have to work hard to justify. Asus has also told us that the original version of the G703 is sold out in the UK and there are no plans to bring more out, so the Asus ROG G703GI is essentially replacing the older model, and we imagine it's a similar story worldwide. In the US the Asus ROG G703GI comes with slightly better specs than the top-end model in the UK. We're waiting on configuration and pricing details for Australia. 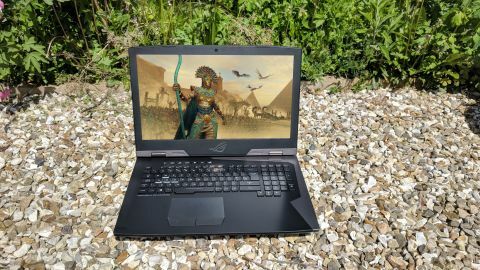 The design of the Asus ROG G703GI is pretty much identical to the ROG G70, so expect a striking ‘metal armor’ design that’s big and bulky; this is no slimline MaxQ laptop like the Asus ROG Zephyrus GX501. Measuring 425 x 319 x 51mm and weighing 4.7kg, the Asus ROG G703GI is a laptop that definitely falls into the ‘desktop replacement’ category, which means it’s not that much more portable than a desktop PC, although it is slightly thinner and lighter than the G703. The large 17.3-inch screen helps to make this a big, heavy beast of a laptop, but it’s a price many may be willing to pay for immersive large-screen gaming experiences. The brushed aluminum casing feels solid, and gives the Asus ROG G703GI a premium look that tells you its owner takes gaming very seriously. As with the G703 there's an ROG logo on the back that glows when the laptop is in use, along with a backlit keyboard that can be set to display a range of lighting configurations. The keyboard itself is excellent, with responsive-feeling keys that have plenty of travel (2.5mm to be exact) and which respond with a satisfying ‘click’ when pressed, similar to a mechanical keyboard. The keyboard on the G703 was one of the best we'd used on a gaming laptop, so we’re pleased to see it included in its successor. The touchpad is slightly offset to the left of the ROG G703GI’s body, but it feels natural to use there, and again it's quick and responsive. Of course, for gaming you’ll want to use a separate gaming mouse. At the top of the keyboard are a set of unique function keys which adjust the volume and mute or unmute the microphone. There's also an ‘Aura’ button, which brings up the ROG Aura software for customizing the RGB lighting. Next to this is a button sporting the Xbox logo, which opens up the Game Bar feature in Windows 10, enabling you to easily configure your game and set up streaming. There's also a button with a camera logo, which launches the popular XSplit Gamecaster software for streaming gameplay, and a button with the ROG logo, which brings up Asus’ Gaming Center software for system maintenance and overclocking. If you use any of these services or features regularly, these buttons will be a great addition, but if you don’t then they're going to be pretty useless. There doesn’t seem to be an easy way to set the buttons to launch other tasks or software, which is a shame, but at least they don’t take up too much space if you’re not going to use them. Build quality is excellent, so if you do lug the Asus ROG G703GI around you shouldn’t have to worry too much about it getting damaged, which is just as well considering the price. The bulky size also allows for a large range of ports, including a USB-C Thunderbolt 3 port, three USB 3.1 ports, a mini DisplayPort, HDMI, SD card reader and Ethernet port. That's a huge amount of connectivity for a laptop, with the Ethernet port an essential component for network play (of course, if you want to go wireless there’s a robust 802.11ac Wi-Fi connection as well). There are also two power ports to plug in the two (large) power supplies, and these end up often being quite inconvenient. You need to plug both into the Asus ROG G703GI for it to charge, so it means lugging them around with you and looking for two free plug sockets wherever you use the laptop. It’s necessary considering the power-hungry innards of the laptop, but it is annoying.